The worldwide cruise market continues to grow at a healthy rate, according to the latest figures released by the Cruise Lines International Association. A record 23 million passengers are expected to sail this year – a 4 per cent increase on the as-yet unconfirmed figure of 22.1 million in 2014. The prediction is based on the fact that forward bookings are ahead of those at the same time last year. The figures were announced in New York yesterday; those for Britain and Europe are expected to be announced at the Cruise Shipping Miami conference in March. 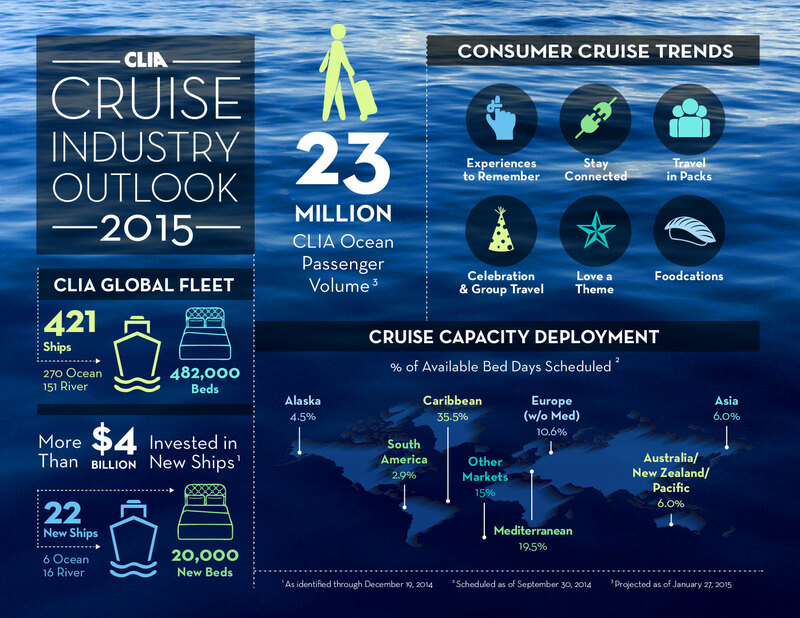 CLIA calculates there are now almost 1,000 cruise ports worldwide, and has calculated that in 2013 the economic output of the industry was more than $117 billion (£77 billion). The industry supported more than 900,000 jobs and paid $38 billion (£25 billion) in wages. The report calculates that 62 per cent of all cruise passengers are repeat travellers, and that 69 per cent rank cruising as better value than land-based holidays. The Caribbean is the world’s most popular cruise region, responsible a third of all ship deployment, but Asia and Australia are a fast-growing market. In 2015, 52 ships will provide 1,065 Asian cruises with capacity for 2.17 million passengers.